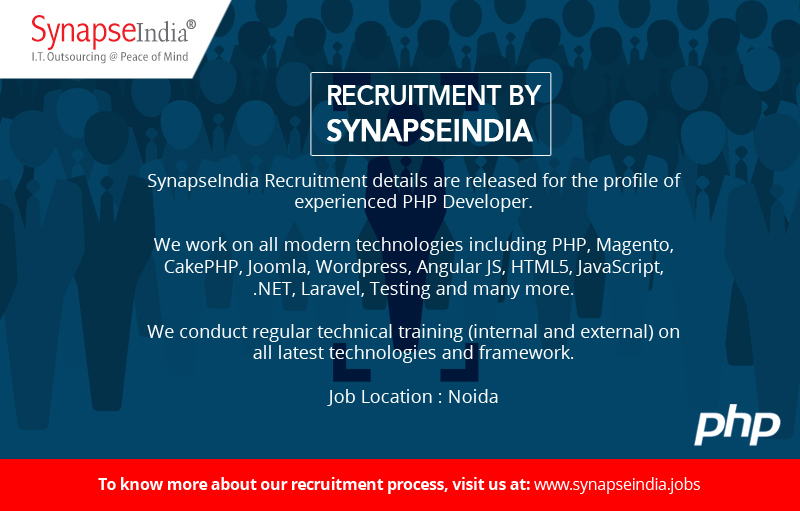 SynapseIndia Recruitment details are released for the profile of the experienced PHP Developer. Shamit Khemka is the Managing Director at SynapseIndia. SynapseIndia came into existence in 2000. The company has 3 state of the art development offices and has a client base in USA, UK, Australia and other European & Asian countries. The recruitment team always conducts recruitment drives for multiple profiles. We have an expansion plan in the future and are looking for analytic and motivated IT professionals who can help the company to accomplish various projects based on quality and service. We conduct regular technical training (internal and external) on all latest technologies and framework.